Nicosia/Lefkosia is an interesting and intriguing place to visit which is unfortunately missed by many people who fly into Limassol or Paphos and head straight for the beaches. We based ourselves in Paphos for most of our time in Cyprus, but prior to the trip, once I learned that it is possible to cross the ‘green line’ – the border which bisects the island into Greek and Turkish areas – I was eager to visit both sides of the capital city. With temperatures at or near 40 degrees Celsius (over 100F) for the duration of our visit, it was a challenging but worthwhile trip. We got lost looking for the border crossing and ended up asking a UN border guard where to go. Our kids were not quite sure that asking directions from someone in uniform holding a sub-machine gun was a good idea. The conversation which ensued, on the role and function of the UN was something which would be difficult to slip into everyday conversation. Crossing the border at Ledra Street requires walking about 1/4 mile through a UN-maintained no man’s land. The buildings on either side of the street are pockmarked with bullet-holes and are dilapidated and crumbling. The absence of commercial activity between the border points is eerie. This was something the boys reacted to immediately. Even with the heat they wanted to run ahead to ‘get out of this area’. 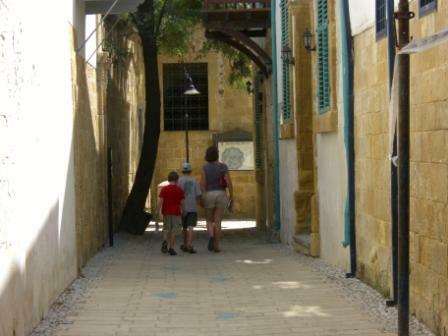 Turkish Nicosia is just getting used to having (Western) visitors wandering through the streets. Currency was an issue – no dollars or euros accepted – and language was an issue – no-one in any cafe, bar or restaurant spoke english. It was good for our kids to see how we managed with this and how the turkish cypriots we interacted with were somewhat diffident, but friendly. The minarets of the Selimiye Mosque are visible from pretty much anywhere in Nicosia/Lefkosia. However, as we wandered around Lefkosia, we passed many buildings flying the red flag of the Turkish Republic of North Cyprus and the call to prayers was closer and seemed more immediate. The mosque, having been originally built as a Christian church at the time of the Crusades and modified, maintained or added to by the Genoese, the Mamluks, the Venetians and the Ottomans is a fitting visual summary of the history of Cyprus. We mostly followed the walking tour described in the Lonely Planet Cyprus guidebook which is about a three-mile walk around the old city. There are 15 stops/sights marked on the tour all of which are totally feasible to visit with kids. My favorite stop was the Buyuk Han, an intact and barely-modified example of a medieval han (inn) where we stopped for drinks about midway through our wanders. It wasn’t hard to imagine being a road-weary traveler in the 16th century, arriving here to stable horses and find a room for the night. This post started as a short, photo-only post as part of the DeliciousBaby Photo Friday series – obviously I’ve got more to say on this topic that I originally thought! I’d be interested to hear your experiences on visiting partitioned countries like Cyprus or other places which are new countries such as the Balkans or ex-Soviet republics – with or without kids. This entry was posted in International Escapades and tagged Cyprus, Nicosia, Travel Photos, Turkish Republic Of North Cyprus on October 23, 2008 by wandermom. I’m glad you told the story with your photos; it’s certainly very interesting. I’ve never been beyond the US/Canada, so I don’t have any experience to add! I heard that the Turkish side of the island is becoming more and more popular as it is less comercialised and you can see something of the old Greece. 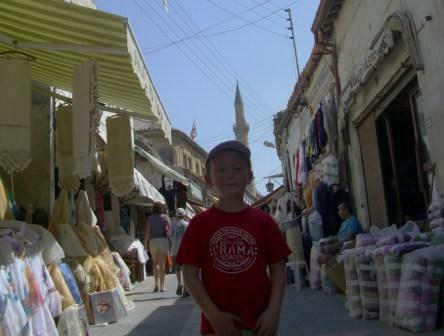 I love hearing of taking kids on travels – it is critical. what great photos and writing you have – it makes me want to head there! I’ve never had this kind of experience myself and am interested to read about yours. My parents (who are professional travelers – apple doesn’t fall far from the tree) recently were in Albania/Kosovo/Macedonia and came back with some interesting stories of accidentally crossing borders they shouldn’t have. Everything is not as neatly resolved there as you might think. Kudos to you for pushing on despite the heat! Intriguing! I’ve only been to Canada and, years ago, Mexico. What an awesome experience for the kids! What an exotic trip! You are a world traveler. I love this blog and I am subscribing. Thanks so much for visting my blog and I will ask more questions regarding skiing with kids…I am so excited but apprehensive at the same time. what a great story.I’m glad you have more to say and love reading about your adventure. Great travels. I used to be an airline supervisor before becoming a SAHM, and I travelled the world with my DH. I’m looking forward to the kids getting a little older so I can enrich their lives like you to with yours. This was a very good blog entry. I am wondering however, when you visited the TRNC (Turkish Republic of North Cyprus)? I have been living in Cyprus for almost 2 years and my husband is a UN Peacekeeper. We visit north Cyprus almost weekly. I wonder when you visited Cyprus because the TRNC has been accepting Euros, American Dollars, British Pounds (and until January 2008, they accepted Cypriot Pounds) for longer than I have been here. They have actually been accepting the Euro since its introduction in Europe. The reason they accept British Pounds is because they have a huge British ex-pat community. Also, 90% of the shop keepers and cafe owners speak enough English for the tourists to get by quite comfortably. I do not speak any Turkish, and I shop and eat there regularly. They have been catering to tourist for a number of years now and are quite good at it. In many cases better customer service is found in the north opposed to the south. It is a shame that you did not experience this. Also, I am not sure if you asked for directions from a UN Peacekeeper or a Greek Cypriot National Guardsman since UN Peacekeepers are not permitted to carry their weapons on their person (certainly not a sub-machine gun). I am glad the you got to eat at Buyuk Han. It is my favourite restaurant for fresh ravioli. I would not have commented except for the part of you entry that talks of the UN Peacekeeper holding a sub-machine gun. It is very difficult for the Peacekeepers on the island. They are trusted to keep the two sides at arms length, all the while having no protection for themselves. It is also very important that citizens of Cyprus, and all of the other participating Nations who send Peacekeepers, know that the UN’s mandate is being upheld. This kind of misunderstanding could lead to issues for everyone involved. It is so wonderful that you had the opportunity to visit Cyprus when you did. We are very optimistic that a resolution will be found in the very near future and the island will change rapidly. I wish you luck in all of your future travels and I am glad that you take the opportunity to inform others of these very interesting places. @L Solonynko: The waiter who served us for our first coffee in TRNC was an older man who got quite flustered when we offered Euros to pay. I’m not actually sure if it was us or our Euros. But, he fetched a younger person who came and helped out immediately. Language was not a problem per se, just markedly different to the level of “english everywhere” which we’d experienced in the Paphos area. I didn’t mean to imply that service was substandard – it certainly wasn’t. Again, just different. The soldier we spoke to must have been a National Guardsman. When I wrote this post, I had totally forgotten that UN Peacekeepers are unarmed. I understand the difficulty and support the work of the UN in their many peacekeeping missions in Cyprus and elsewhere. Thanks for pointing out my inaccuracies. I hope your husband stays safe in his current mission.